In looking for other famous family trees, I came across someone who had compiled a tree for Winston Churchill with more than 6000 people in it. 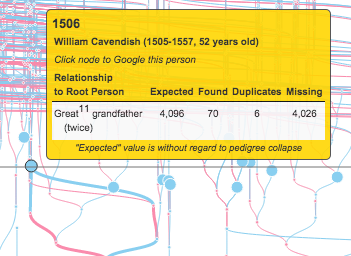 He graciously sent me a GEDCOM file of this tree, and I have included it as one of the samples in the (d3) family tree visualization project I am playing with. A screenshot is below. I had to cull people born before about 1300 because of (apparent) needed optimizations in the processing steps. It's kind of a mosh pit prior to 1300, anyway - the "widest point of the Ancestor Cone happens for most of us around 1200AD" (info via Tim Urban's awesome article on ancestors/pedigree collapse). GEDCOM file courtesy T. Dowling. There is something universal and beautiful about this tree. Universal because, for the most part, all of our trees probably (qualitatively) look like Churchill's from this level of view. Beautiful because of the swooping patterns of wandering streams of genes that are making their way down a genetic Pachinko board to the very existence of you and me. The Mere Existence of Complexity as Insight? Visualization of network diagrams can sometimes seem to provide no more insight than "ooh, it's complicated." But maybe sometimes that is enough. At least, for an initial impression. You want to be able to dive down into the details on demand as well - you can do that with this interactive visualization, and I am still working on that (like zoom/pan) - but there is still admittedly simply a "ooh I never knew it was so complicated" flavor to this for large trees. On a more mundane note, I have been playing with how to alert the user that they can click on a node to do a Google search for that person (it opens in a new browser window). This provides an in-the-moment way to quickly learn more about an ancestor, and has already been interesting and useful for me. I wanted to make this information persistently obvious to the user, but not overwhelm other details being provided. For now, I decided to use an italicized extra line in the popup. that they can click on node to get more info.